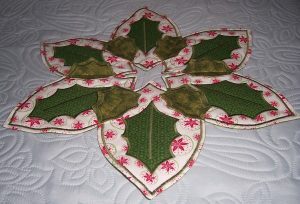 This table centre was made using a design from Thimble Art as the starting point. Fabric was three fat quarters purchased from New Threads Quilt Shop at Weyhill Fairground plus some fusible wadding and fusible interfacing for the appliques. 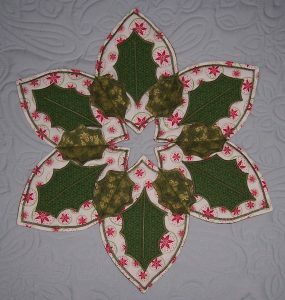 The changes that I made were to include satin stitching around each of the petals and also an applique Holly leaf on each petal. The shape of the petals was also extended at the centre point so that there is a resultant 6-point star shaped void. The void could be filled with a floral arrangement, a piece of fabric or simply left blank. 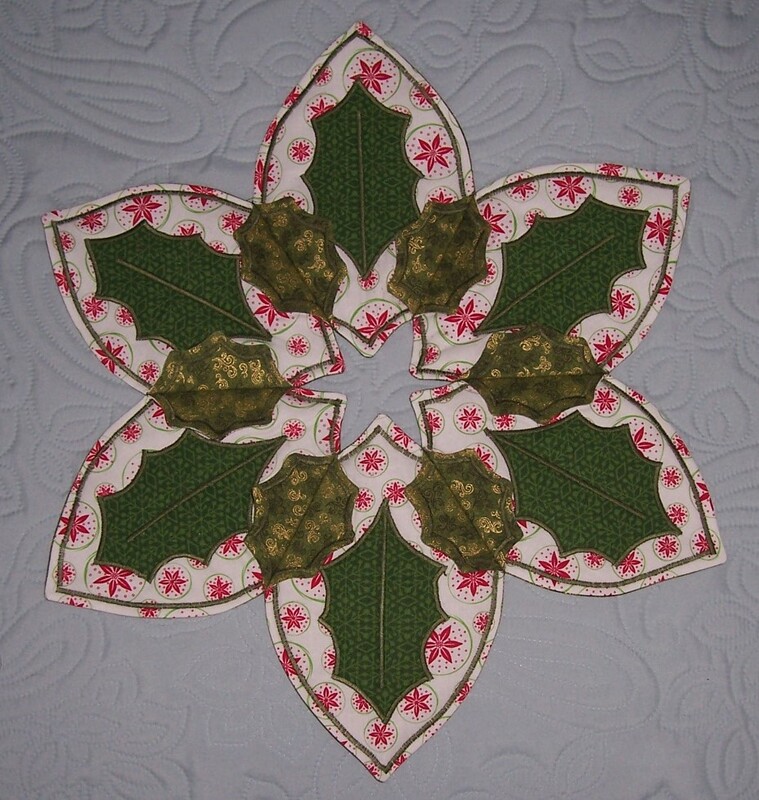 I found that the heavy satin stitching around the curves of the petals did distort the fabric slightly but the issue was resolved with a hefty blast of the steam iron. For the next incarnation I have changed the shape of the petal so that the outer shape is squared “on grain” and therefore will not stretch out of shape. I have included a Disclaimer in respect of the use of a candle arrangement in the centre of the mat. Health and safety must always be a priority and in view of incidents in the past I want to discourage and avoid the use of candles anywhere near fabric and/or flammable arrangements.